Almost two years ago, I wrote a letter to CBeebies. Now, as rumours of BBC cuts hitting my beloved pre-school channel start gathering pace, I thought I’d write another letter. I want to thank you once again for what you provide. Two years ago I was mostly praising I Can Cook as it was one of our favourite shows, and got M into the kitchen and cooking – more than just pink icing and sprinkles over cupcakes, too! Now though as our school adventure starts, I’m really starting to appreciate all the other stuff that comes with the CBeebies bundle. Let me start with your website. It’s such a popular choice that it appears on the home screen of my browser, as one of the most visited websites. I am confident I can let M navigate her way through it without having to periodically check she hasn’t strayed onto anything less than savoury (hellloooo, Youtube!). M watches clips from Melody and tells me all about the sights, sounds and feelings of the music she was listening too. She works her way through the increasingly difficult levels of Nina and the Neurons problem solving puzzles, joyously shouting out when she finally figured out a really difficult level. She learns so much about dinosaurs from Andy that she corrects me when I call something a Pterodactyl, saying “actually it’s a Pterosaur, mummy!”. The website is so intuitively designed that M can navigate it with ease, and it naturally directs her to age-appropriate learning games and clips. Then the apps. 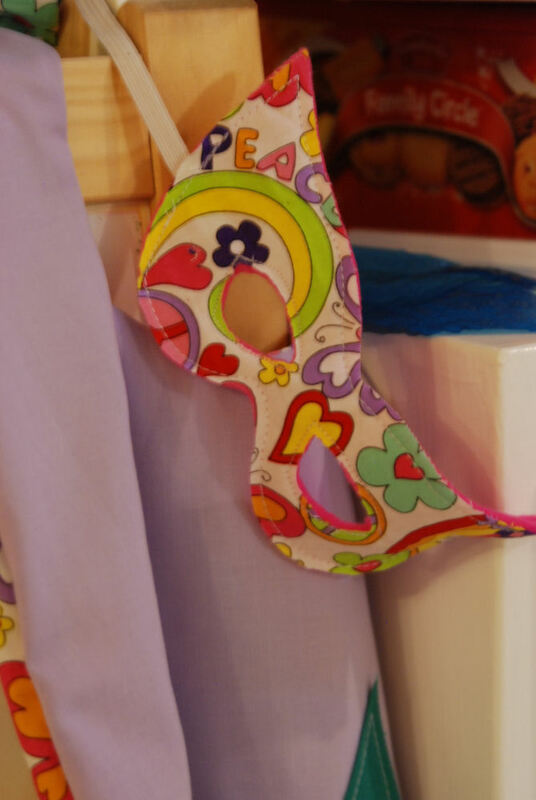 I loved the CBeebies app when it first came out – I love it even more now! It is updated just often enough to keep the interest there, and little details like collectable bugs, stamps and badges help enthuse young players. The Storytime app is also fantastic! A whole library of stories to read or have read to you, with interactive elements that entertain both my 2 year old and nearly 5 year old. That’s all aside from the channel itself. CBeebies is there at 6.00am when I am up with a hungry toddler, who was also up in the night several times teething. It’s there at the end of the day when tired children need to flop and watch something soothing before dinner is ready (how I love Abney and Teal!). It’s there on lazy weekend mornings when we all squash into one bed and watch Postman Pat and Q Pootle 5 while eating toast and drinking tea. It’s there ALL DAY when children are poorly and just want to snuggle up under a duvet and watch something familiar and comforting. And I love how it’s both entertaining and improving! Sure, some shows are just there for fun (I’m not convinced my children have ever learned anything from Peter Rabbit, unless it’s not to trust handsomely-dressed foxes or fly a home-made kite/glider in a storm), but many, many, of the shows are just perfect for my children. E learns familiarity with numbers from Numtums, while M can watch the same show and do the maths herself. They copy Squiglet and draw things they have never attempted before. The phonics of Alphablocks, the messy fun of Mr Maker, the amazing array of singing, dancing and music on ZingZillas. Everything inspires and I find myself drawn into the shows as much as the children! So, thank you CBeebies! Thank for you providing for my children from baby to schoolgirl. And please, please do not be pressurised into cutting the budget from this wonderful service! Yours, one grateful mum and satisfied customer. Saturday, Tom was out on some kind of epic bachelor-esque 15 hour solid role play gaming session at someone else’s house. He wasn’t expected back until the morning, or if not that then very late indeed. Opportunity for some girls-only fun at Chez Moi! I wish I’d had my camera with me all day. We did some great stuff! It was exhausting, and reminded me what maternity leave was like (and reaffirmed my belief that I am not cut out to be a stay-at-home parent. I’d drive myself into the ground!). We started off charity shopping in Tidworth. M was not keen on this prospect, because it usually results in me not buying her the bright pink batter-powered Sparkle Girls Rock Guitar, and looking at boring mummy-clothes for ten minutes. This time though we struck gold – a perfectly M-sized Moshi Monsters micro scooter, in pretty good condition and solidly-built, for a mere £3! 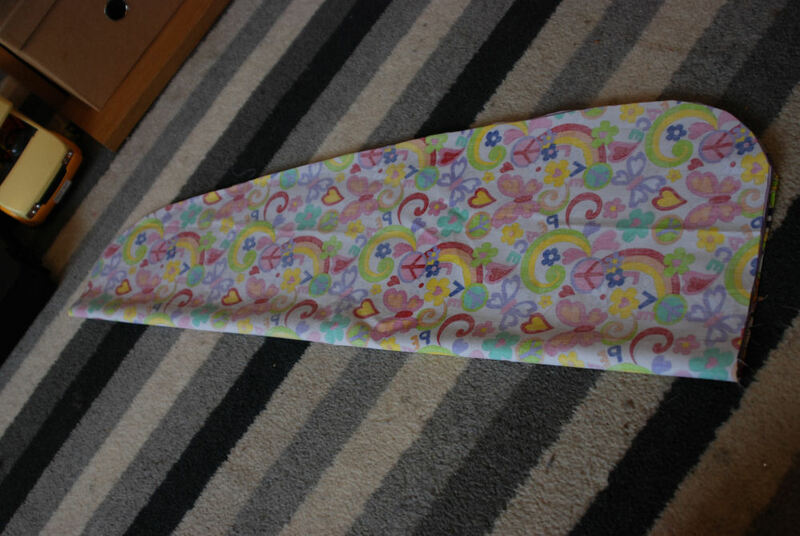 E also found a Thomas the Tank Engine toddler-sized umbrella, so I bought that for her too. We headed to the park next, via the car garage so I could assess the locally available estate cars since we will be upgrading soon. M got rather unexpectedly excited by the prospect of car shopping, and was jumping about shouting “Can we drive this one, Mummy? Buy it, buy it! Mummy, buy this one!!”. We got to the park in one piece, even though I did get stuck at one point by letting both girls walk along a wall at the same time. I couldn’t let go of E to help M down, and E refused to come down anywhere other than right at the very end of the wall where M was standing, so I had to get E down, get M down, put E up again, let her walk the two steps to the end, then get her down again. Sigh. We caught the bus home, which was VERY exciting for E. She sang various verses of The Wheels On The Bus all the way to the bus stop, all the bus drive home, and most of the afternoon after that. While E slept, M watched The Aristocats, then we started painting. M wanted to do foot print painting, which is always fun but VERY messy! E woke up halfway through, so she joined in as well. 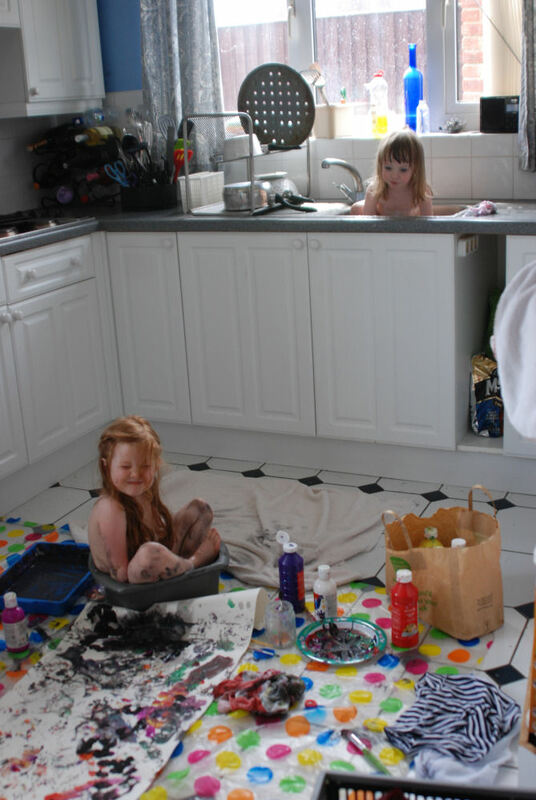 Soon both girls were covered in paint on the feet an legs, and various other body parts. I got out a sink full of bubbly water for M, but E wanted her bath too so ended up in the kitchen sink like a newborn! Then they snuggled up on the sofa in their towels while I cleaned up the mess. When they were dried and dressed we went to the shops for a few bits for dinner. M cycled and E was in the pushchair. I let M cycle on the road, as it’s a very quiet crescent and there are always lots of kids on bikes in the holidays. At the end we crossed onto the pavement. Then on the way home we were crossing the road – Me pushing E, M pushing her bike, when a car appeared (very slowly and a long way off). M panicked, tried to mount her bike, then flailed about not cycling anywhere and crying in complete blind panic. I had to run E to the pavement, abandon her there, then come back to help M. The car had, of course, stopped, but M was in floods by now. We had to have a chat about safe crossing of roads, and not panicking, and walking quickly but calmly. Last time I let her push her bike across though! She’s normally so good. Once home we crashed. CBeebies website was located and I did dinner. The girls crashed out at about 7.00pm, though E took a while to fall asleep (she was happily singing The Hokey Cokey to herself until about 8.30pm). I settled down with a cup of tea and Downton Abbey. In the quiet (ha!) times I had also managed to make millionaire’s shortbread, banoffee pie (well, I had leftover caramel – what would you have done?) and caught lots of wees on the potty! Tom came home at about 3.30am. I took the girls to church to let him have a lay in. M is notably bored when there’s no Sunday School, sadly. She’s too old to entertain herself with colouring pens and toy tractors from the toy box, but not yet old enough to want to pay attention, even what it’s a Christening and the vicar is using juggling balls to represent the Trinity. E, though, is happy as Larry playing with the other toddlers and not fighting too much over the best toys. Then over the weekend potty training started. I hadn’t intended it, but much like her older sister, E just decided the time was ripe. We had the potty out and she was just using it. Simple as. It’s been going pretty well, for early days. 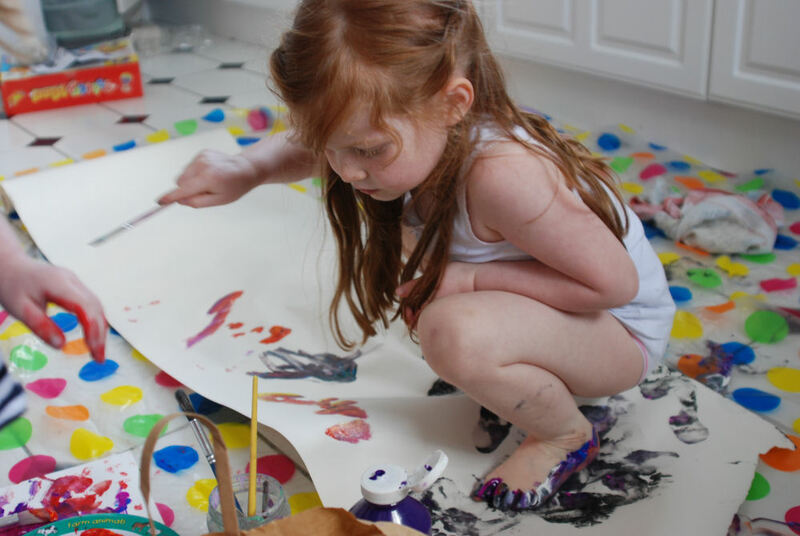 On the weekend while at home she was mostly naked form the waist down, and would use the potty when offered. Once she even took herself! Out of the house she had a nappy on, but at the first opportunity we’d take it off and let her use the potty again. Not quite ready for pants, I think, but probably not far off either! 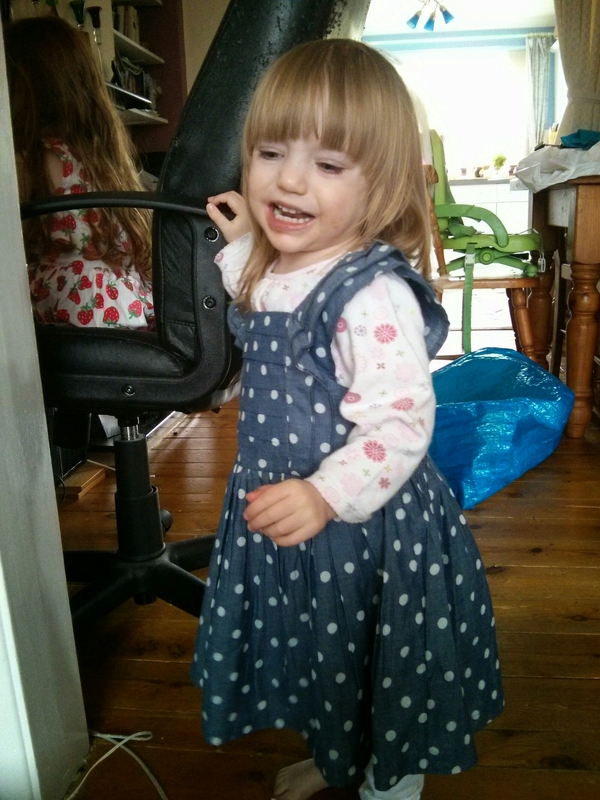 She’s been at nursery this week, and has been in nappies but offered the potty at every change. She’s happy to switch between the two, it seems, which is great! At the moment she’s just very pleased to be using the potty, being a big girl like her sister. 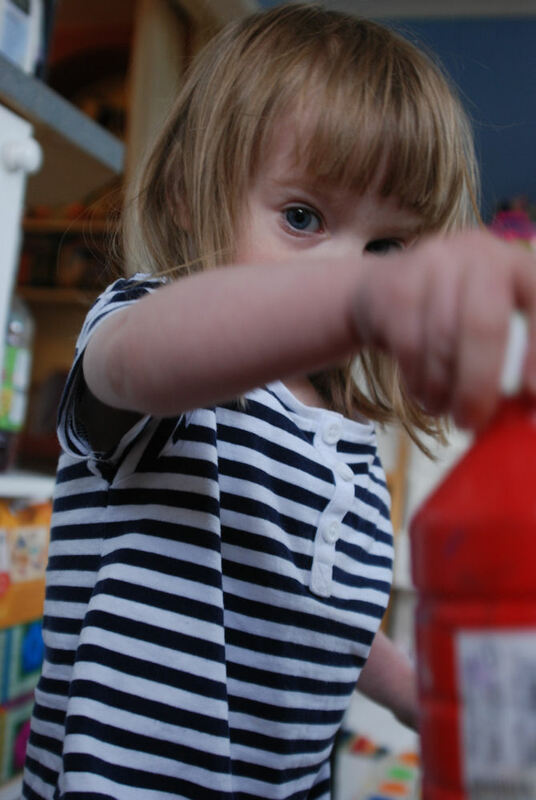 For a while she refused to use the potty, preferring the much less easy option of the toilet, which she can’t do without help (but refuses help in trying). 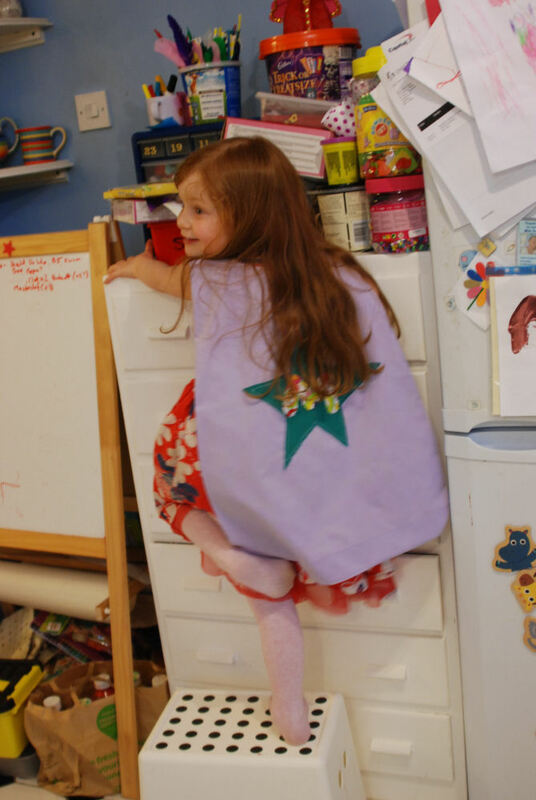 Thankfully the novelty of Grandma and Grumpy’s potty, left over from M’s early potty training days, convinced her of the benefits of a small pot at her height she can easily get on and off by herself. This coming weekend I’m going to see if we can go nappy-free for all awake hours. It will be a challenge! And I’m expecting to have to clean up mess, but that’s okay – we will both be learning how long E can go between potty breaks, and she will be learning to read her body’s signals. 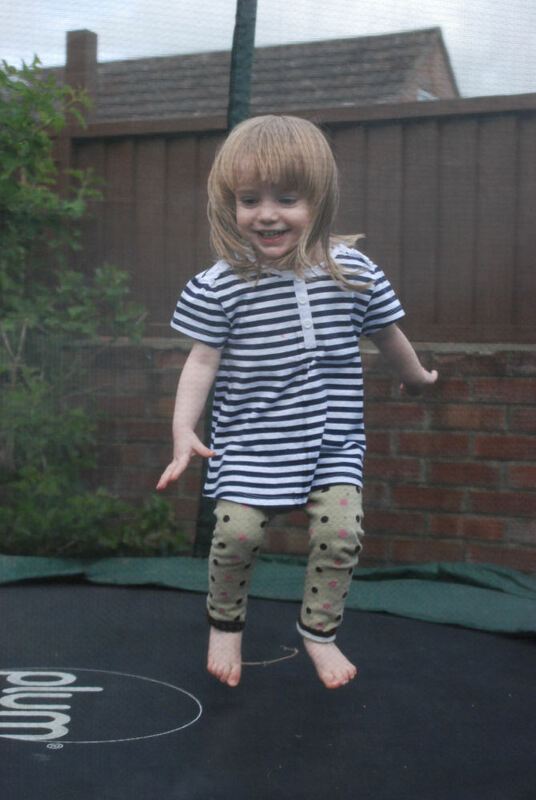 E is much younger than M was when she potty trained – I think M was about 30 months, whereas E is only just 24 months. I wonder whether any of that Elimination Communication we did when she was a baby counts for anything? Did it help make a connection early on that helped her learning her body’s elimination signals? Or is it all just coincidence? Me, holding up much-loved Peppa Pig top: “let’s get your t shirt on”. I start putting the birdie t-shirt on. Cue more screeching. E attempts to put the clothes on. Usually putting a foot through the arm hole, or getting stuck. I know she cannot yet get herself dressed, but if I try or even offer to intervene there is much screeching once more. Instead I wait for her to get frustrated and ask for help. Thankfully she is getting better at learning her limitations and accepting help mute readily. Sometimes. Other times, E seems to go straight from calm and content to full on tantrum, with me having no idea what the problem is. Sometimes the problem is quite a real one (hair bobbles causing discomfort in the car seat). Other times it’s something more abstract or trivial, but of no less importance to a two year old (biscuit fallen in half, mummy saying “bark” rather than “woof” for the dog in Old McDonald’s Farm). I try to work out what is upsetting her, really I do. I know she is not ‘pushing my buttons’ with this behavior, but struggling to make sense of the huge world she inhabits and figuring out boundaries and limitations. Sometimes, though, it can take 10 minutes to figure out the problem. Sometimes I do not have 10 minutes. So we muddle through as best we can. It’s just… hard work. It’s natural at this age to start testing the limits. Figuring out, for example, that you can play away from mummy and daddy, come back 15 minutes later and find them still in the same place, opens up a world of opportunities! But some things you want to try result in different reactions from parents. 6 months ago when I hit the cat, mummy said “shush, gentle hands”, showed me how to stroke nicely, and then distracted me with some other toy while the cat hid. Now when I hit the cat, the toy does not distract me because I know the cat is more fun, plus I get a good reaction from mummy! So I deliberately seek out hitting the cat. Mummy and daddy have to figure out a new method of (gentle) discipline. We also get a lot of: Hit sister, get told off, get removed from situation, be asked to say sorry and give cuddle, hit sister again. The game has become ‘hit, cuddle, hit, cuddle”. So we have to figure out what discipline is going to help here. I like ‘time in’; that is, remove child from situation, but stay with them and talk about it. Obviously E’s ability to discuss her feelings and reasons behind hitting her big sister are fairly limited, but we can at least say to her that hitting hurts, and we don’t hit, and we are gentle with our friends and our toys. It’s difficult, though. M never really went through terrible twos, so this is new territory for us. 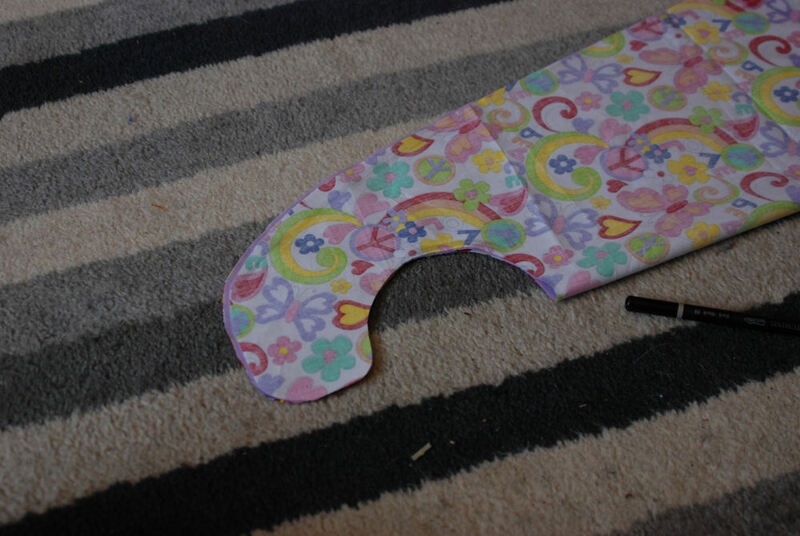 E likes laying face down on the floor to complain about the unfairness of not being allowed a chocolate button for a snack, or to draw in the ever-so-tempting visitors’ book at nursery. She likes escalating volume and flailing levels to 11 with amazing speed. She has learned to grab at her mouth when she cries because she remembers teething pain getting her sympathy. But she does, thankfully, calm down quickly again. And she’s still distracted with relative ease by flowers, tractors, dogs, or a verse of Old McDonald (or “Donaaaaallllld!” as she mournful wails). And of course the one thing that almost always works to stop the strop and reset the toddler back to factory settings of calm and cheerful: breastfeeding. Yes, parents, this magic wand is still working! She might only be feeding twice a day now, but it’s still liquid magic. Life in unfair because my sister is in the spinny chair and I am not, even though 5 minutes ago my mum offered to put me in the chair and I said no. Also my fringe is wonky. Waaaah! Back in the Autumn of 2014 we visited two local schools that we were considering for M. Our local school, which was huge and impressive and well-resourced, but had no after school or breakfast clubs to extend the day, and a school local to our work which was small and village-community-feel-y and had the ability to take children from 08:00-17:30 each day. Well, we chose the big school, the one close to home. M can make local friends there, and we would just have to cope with the disruption of school hours conflicting with work hours. We agonised over the options for this for ages! We researched child-minders, clubs, reduced working hours, extra cars, au pairs, pre-schools, holiday clubs. 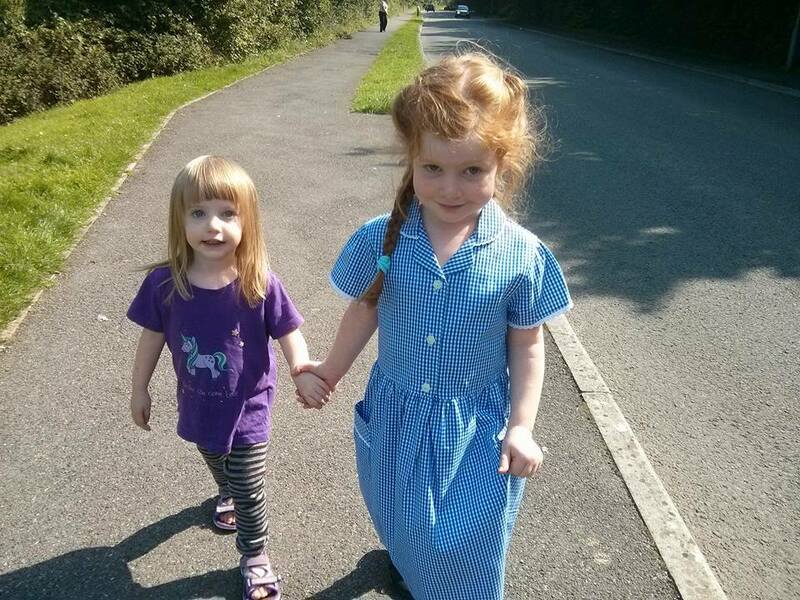 We costed up various options, but in the end chose one of the more expensive options; reducing our working hours, buying an additional car, keeping our youngest in full time nursery, and doing the school run ourselves. The reduced earnings pretty much exactly offsets the nursery fees we currently pay, so we will be no better (or no worse) off than we currently are. BUT (and this is a big but) we get to spend that quality time with our eldest daughter at a point in her life when, I believe, she will really need it. I don’t know how quickly she will adjust to school life, but the idea of her struggling with it, and us not being there at the end of the day to help her, is not something I want to consider. I want to help her with her homework, such as it is for a 5 year old. I want to spend time with her at home, enjoying the afternoon sun in the Summer and getting some valuable home maintenance done. I want to teach her to ride a bike so she can cycle the half mile to school and back with me (and of course, all these joys shared with Tom who is also dropping his hours). The other consideration was that we don’t have to stress about child-minders closing due to illness, leaving us in the lurch at the last minute. We aren’t beholden to fee rises and term time only and paying for places when we (or they) go on holiday. So, school application went in in early 2015. We applied for just one school, no second choices. We were in the catchment and they told us they almost never turn people away – if they are over-subscribed they just open more classrooms! Unsurprisingly we got in. Some of my friends have not been so lucky, being rejected from all three of their school choices or getting second or third choice placements. M is excited about starting school! She keeps asking when she will start and asking what she will wear and what she will learn and what it will be like. I am looking forward to this new journey! I hope we will meet some friends, both for M and for ourselves as parents. It would be good to have someone to fall back on for quick emergency play-dates or homework stresses or school trip worries. I have day dreams about the quiet family who live just down the road from us, who have children of about the same age. M will run round to theirs and knock on their door, and they will play until tea time. Meanwhile I will sit and enjoy a cup of tea and a natter with my new-found mummy friend and we will share ideals about parenting and so on. You never know, it could happen! 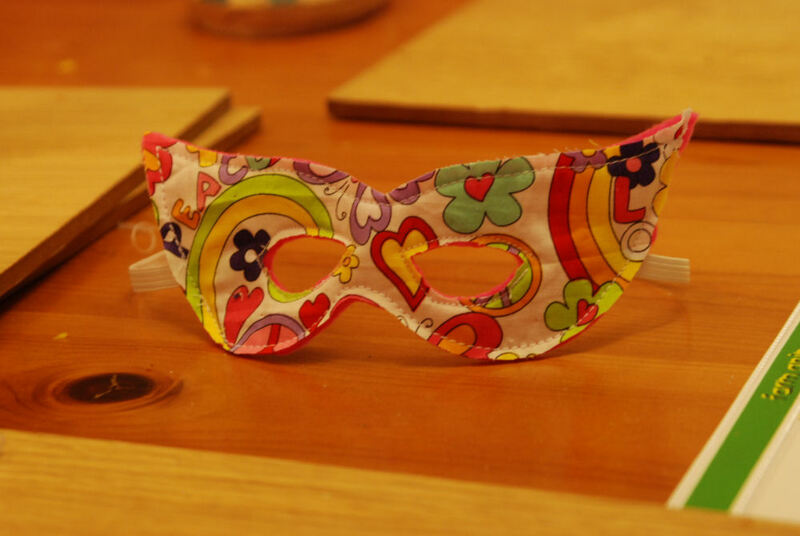 The girls have been invited to a superhero party. I thought I’d make them their own capes and masks for this, rather than let M go as yet another Disney princess (as inevitably happens, regardless of the theme of the party!). 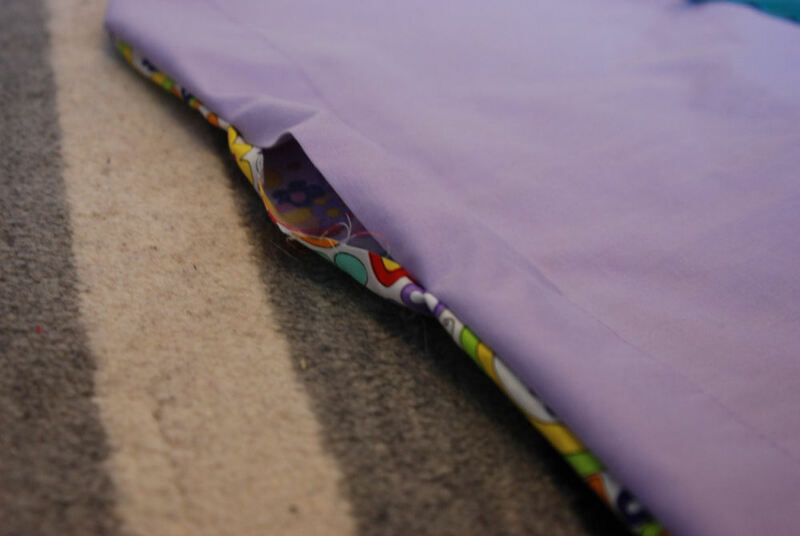 Cut the pillow case in half along the bottom and side edges. 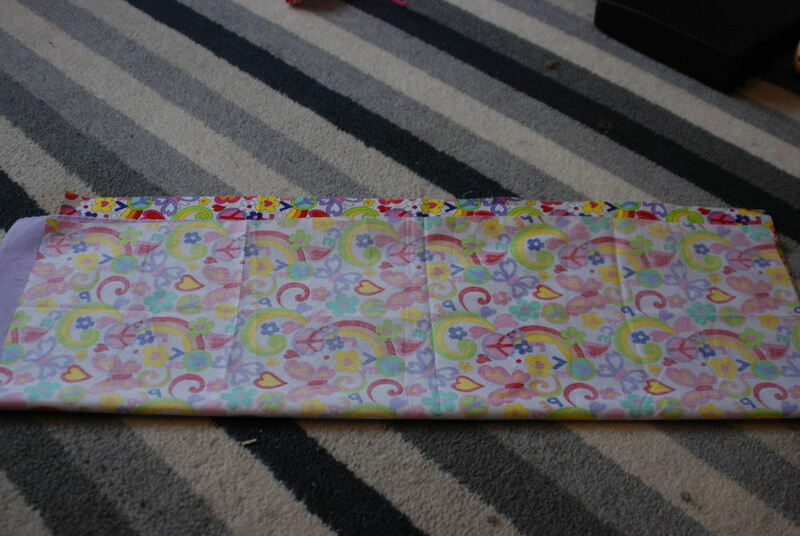 Lay the two sheets of material (pillow case and lining) right side to right side, and fold in half vertically. Open out, and pin together. 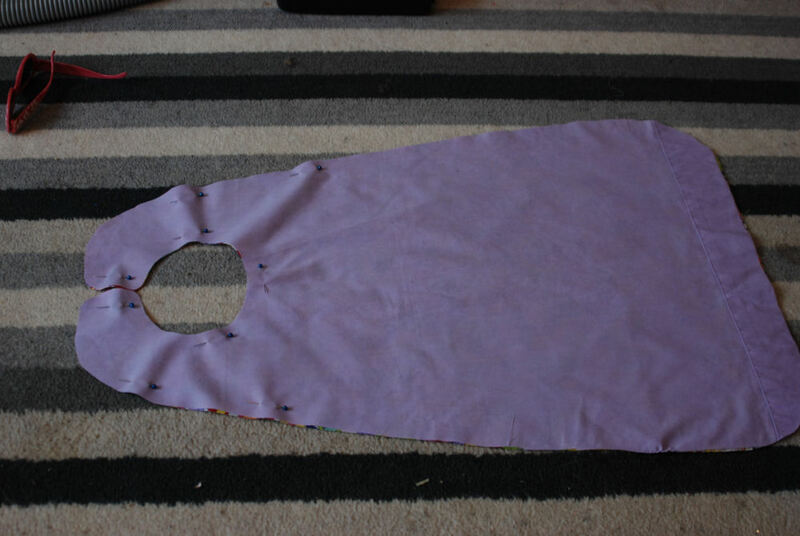 I’ve only pinned the top half because I am adding a decoration to the outside of the cape. If you don’t want to do this, simply pin all round the cape and skip the next few steps. 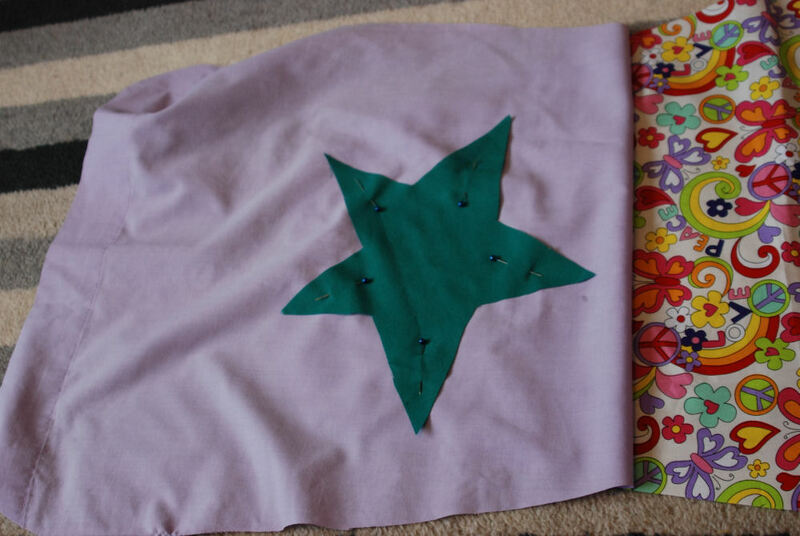 Fold back the top layer of the cape to display the right side, and lay on your decoration. Pin in place. 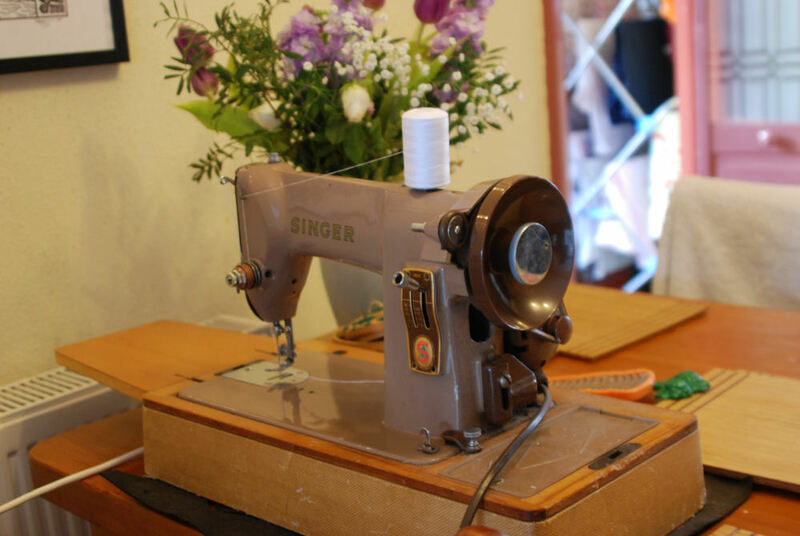 My sewing machine is old and only does straight stitch. 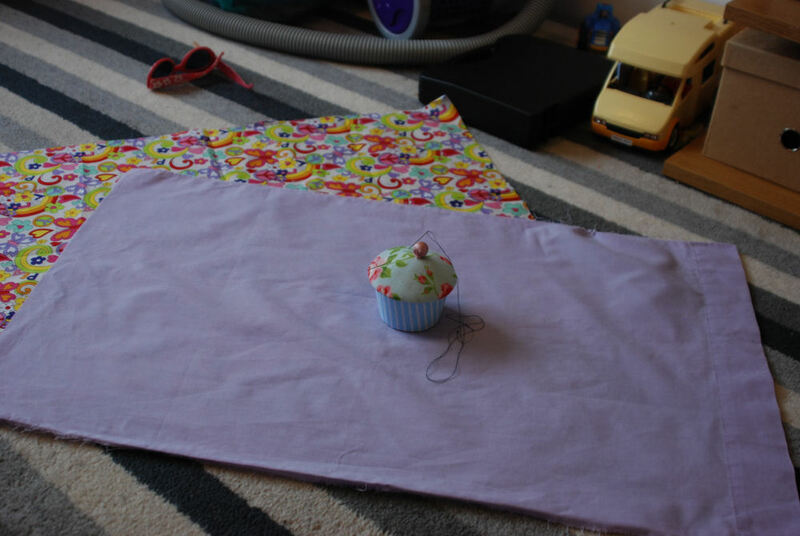 This is all that is required for the majority of sewing! 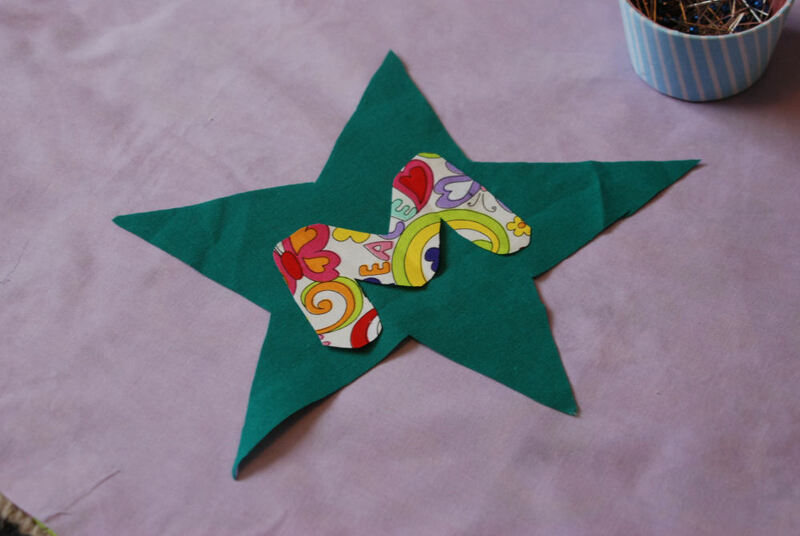 Don’t fear that you cannot make awesome things for your kids because you lack the ability to do zigzag stitching or overlocking! 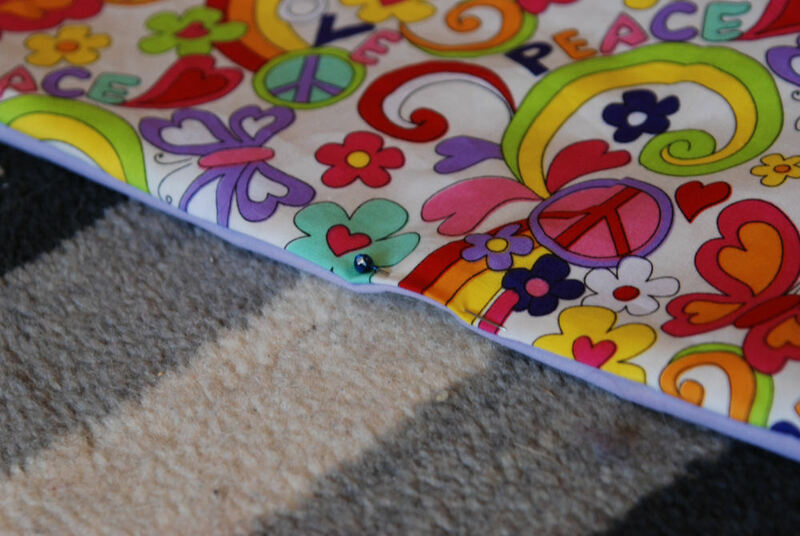 Sew the bottom bit on first. 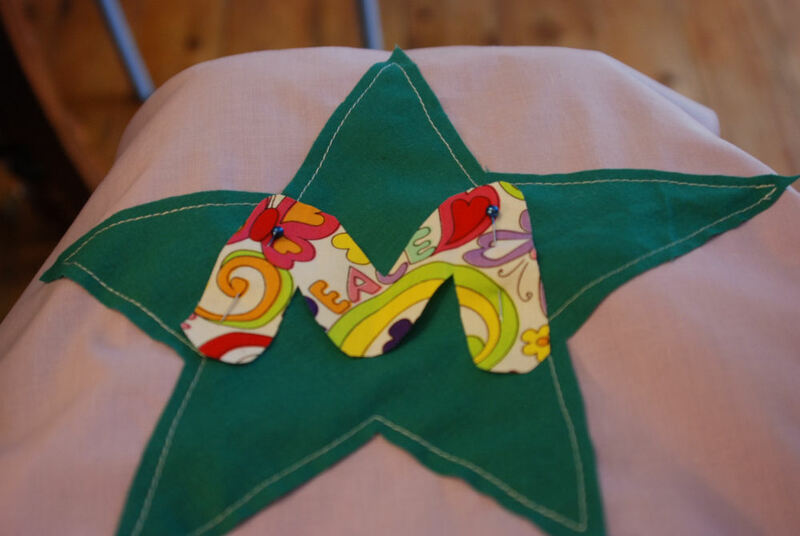 Next pin your Superhero’s logo or letter in place, and sew that. 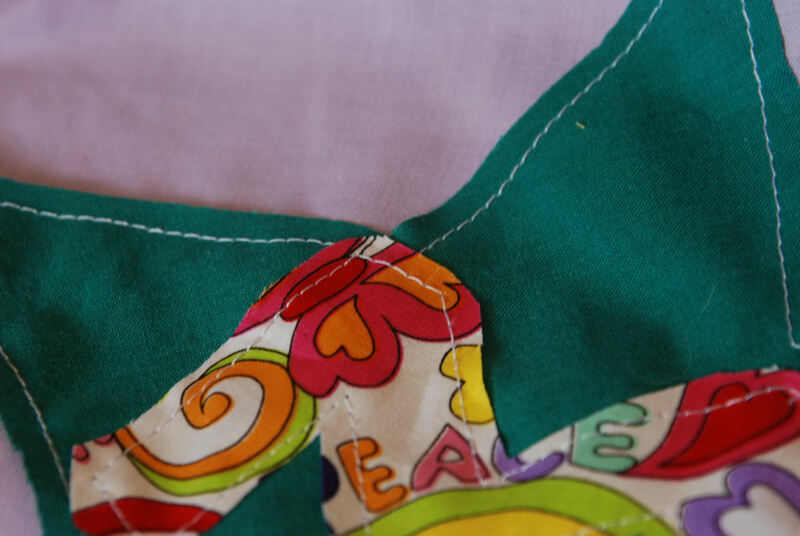 Going round the edges of fiddly letters isn’t easy, so here’s a hint: when you need to change needle direction, leave the needle down, bring up the foot, and turn the fabric round. 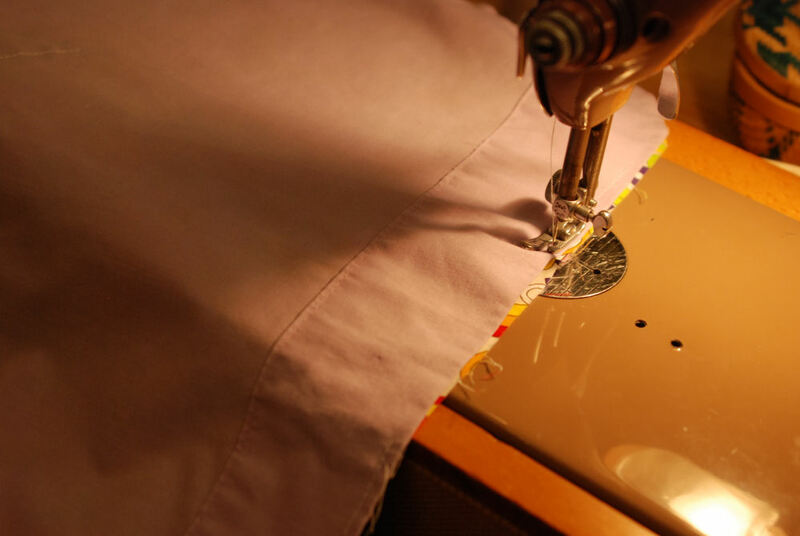 The needle being down (through the fabric) stops it moving about, allowing you to jut twist it to a new orientation. 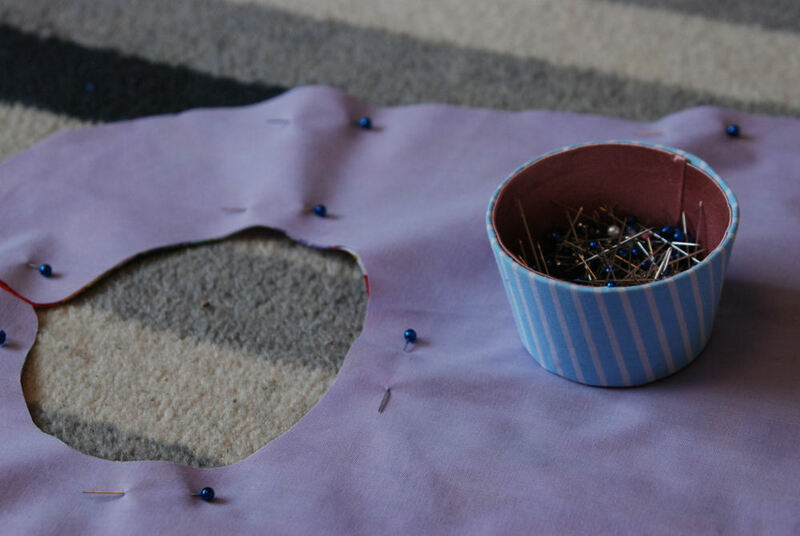 Next, lay your top layer back down and pin all around. 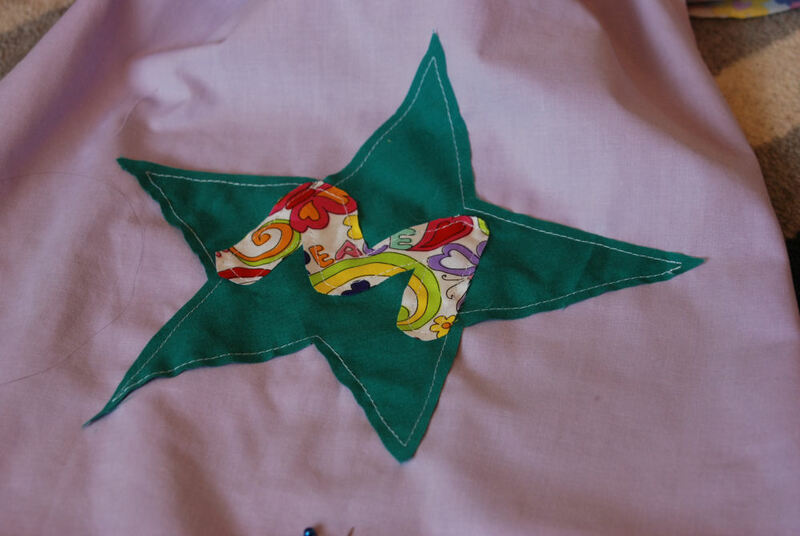 You can just see that the star logo is inside the two layers of fabric. 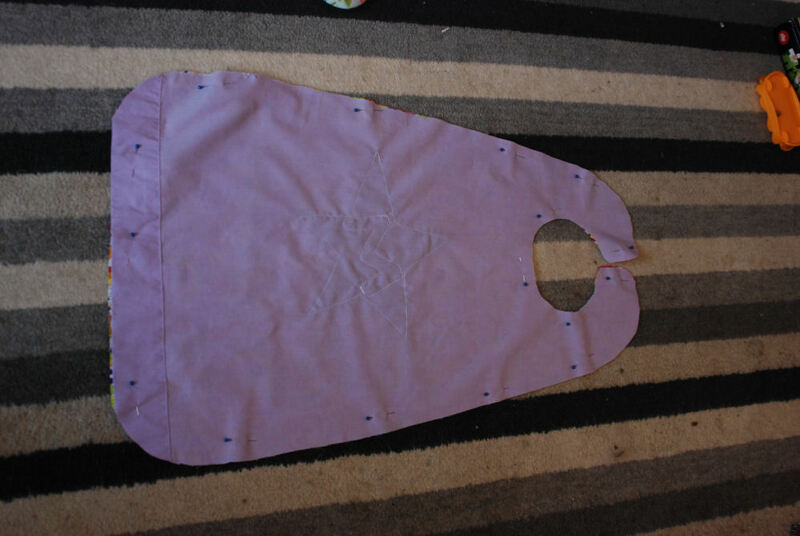 Sew all around the outside of the cape, leaving a gap of about 5cm along the bottom to allow you to turn the cape inside out. 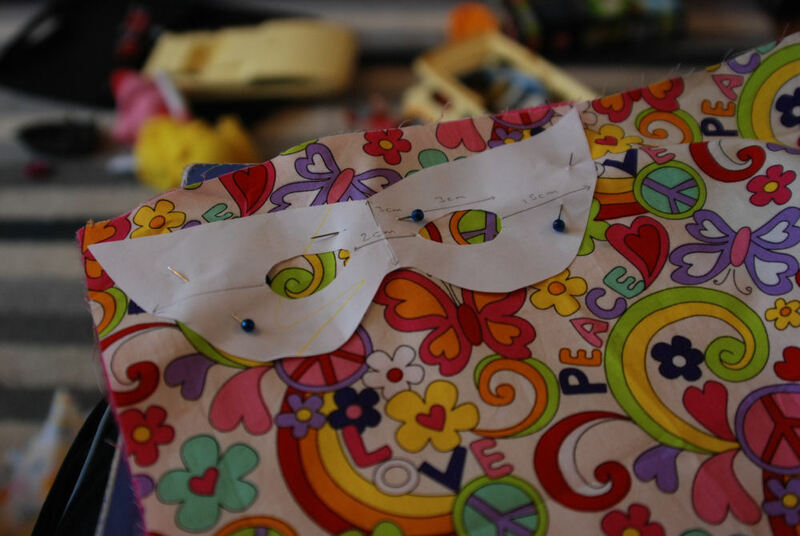 Once you have turned the cape inside out, fold the raw edges inside and pin in place. 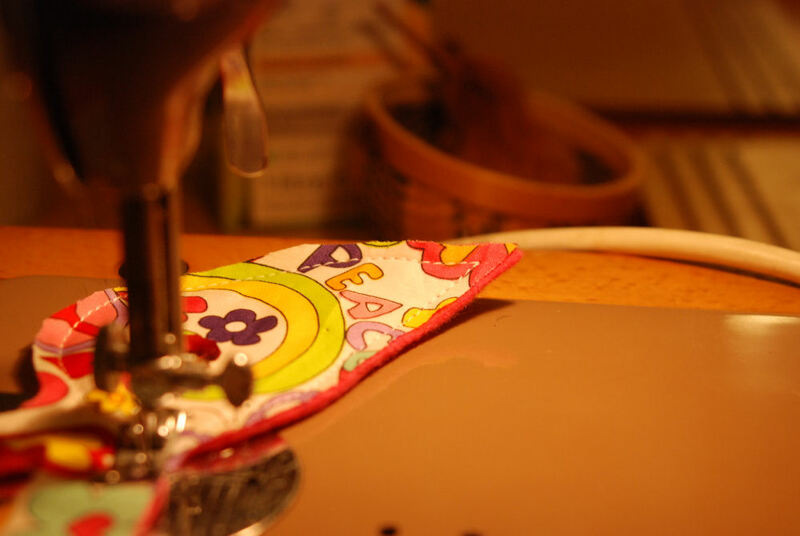 Sew a little line of top stitching to seal the hole shut. 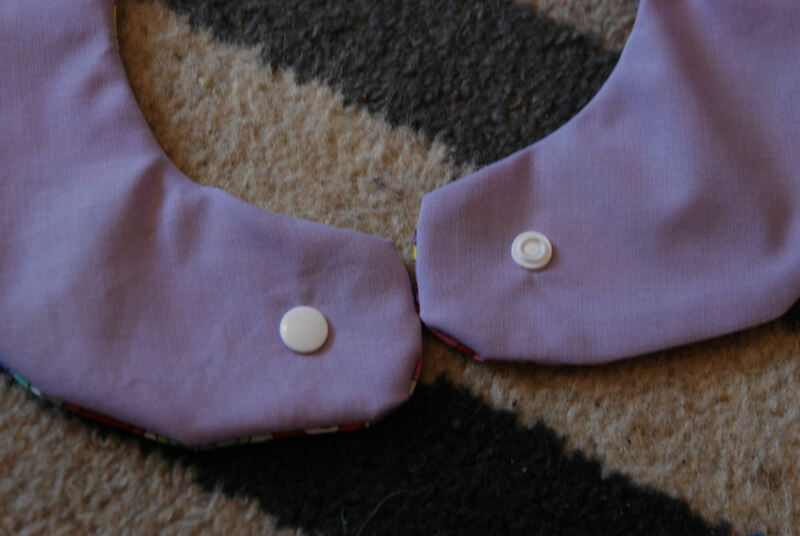 Add some poppers, or other fastening of your choice, to the top section of the cape. 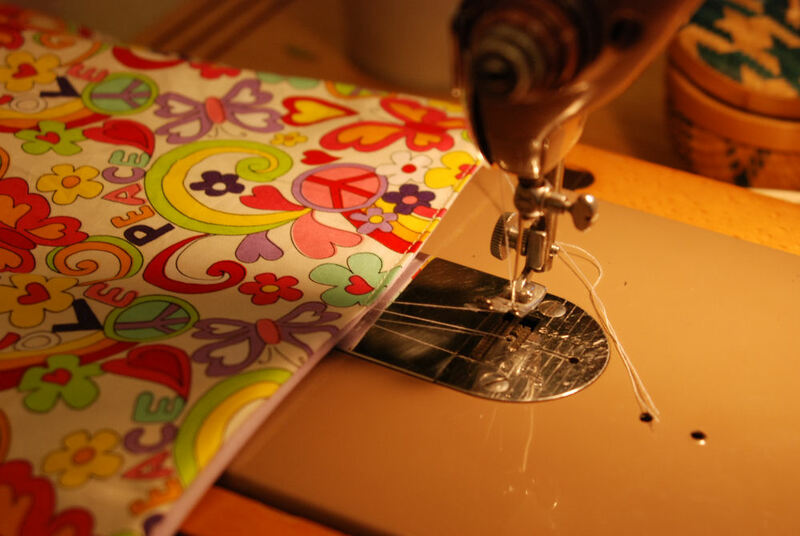 Place your template on top of your fabric and pin in place. You can see the approximate dimensions here. 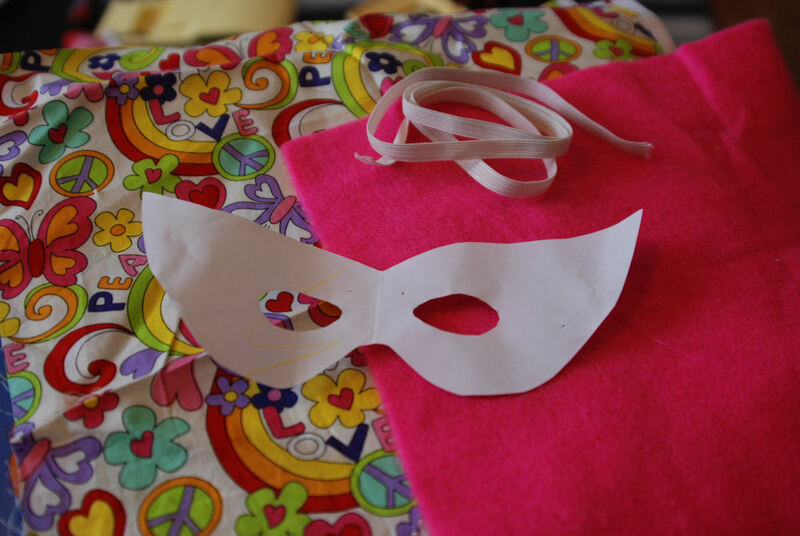 Note that the mask does not get turned inside out, so ensure the fabric is placed wrong side to wrong side. Cut all around the template, including the eyes. You can see how the felt adds structure. 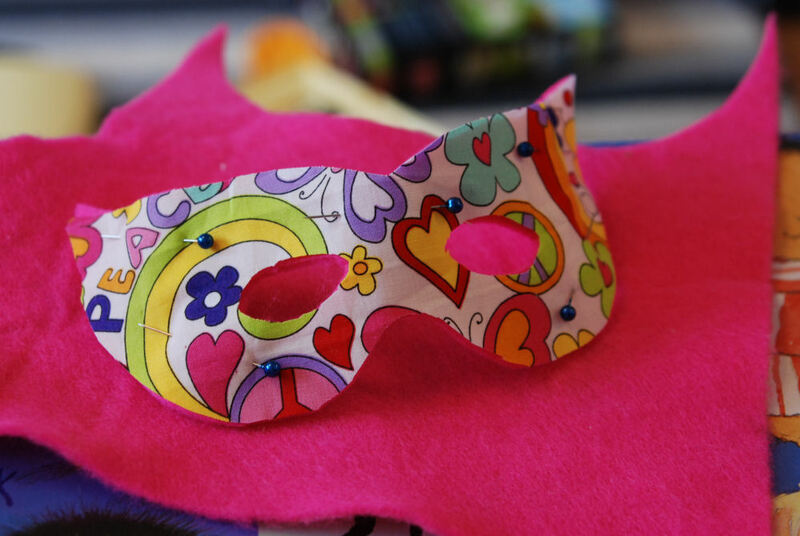 Sew all around the outside of the mask, including the eyes. 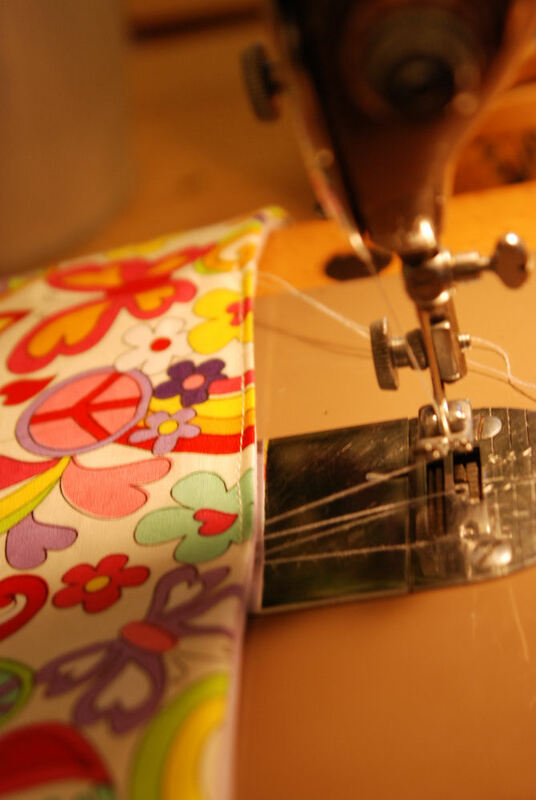 Make sure as you sew the sides up you poke the elastic in! 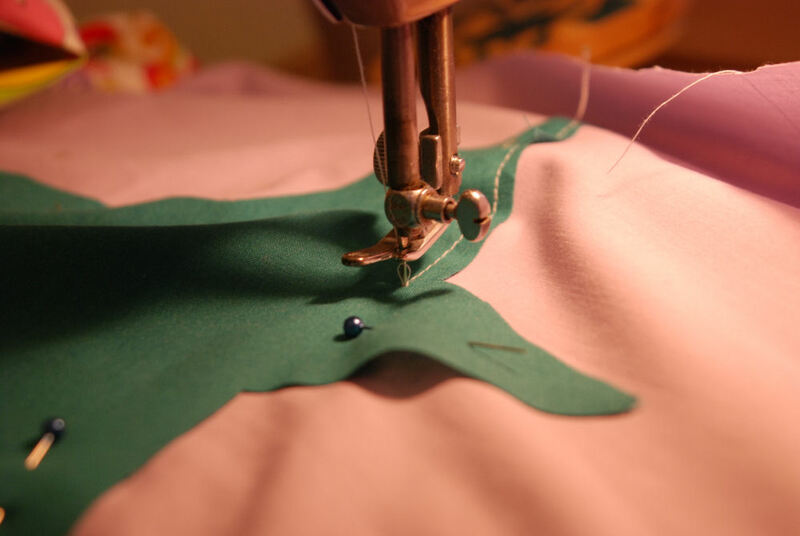 I forgot to do this and had to unpick and sew again (oops). Here I’ve had to trim as I’ve not gone close enough to the edge. A large raw edge is likely to fray, so best trim it. The finished mask! 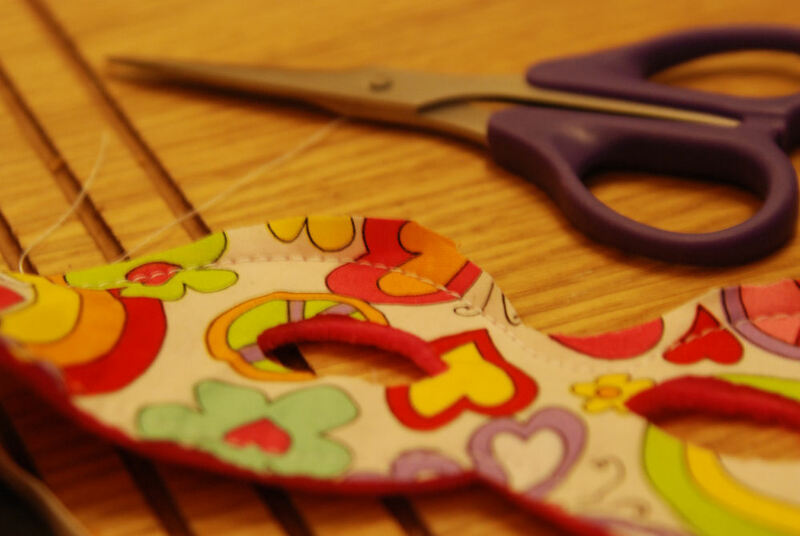 Measure the elastic against your own child’s head, but as a rule it should be a little wider than the width of the mask. Every so often (usually around this time of year, when the weather is just starting to show promise of loveliness and I forget about the horror that is grass growing more quickly than I can mow it) I get all inspired about the garden. Now is that time! I’m a bit miffed that I am still recovering from surgery and gardening is strictly forbidden, but I can at least plan, right? 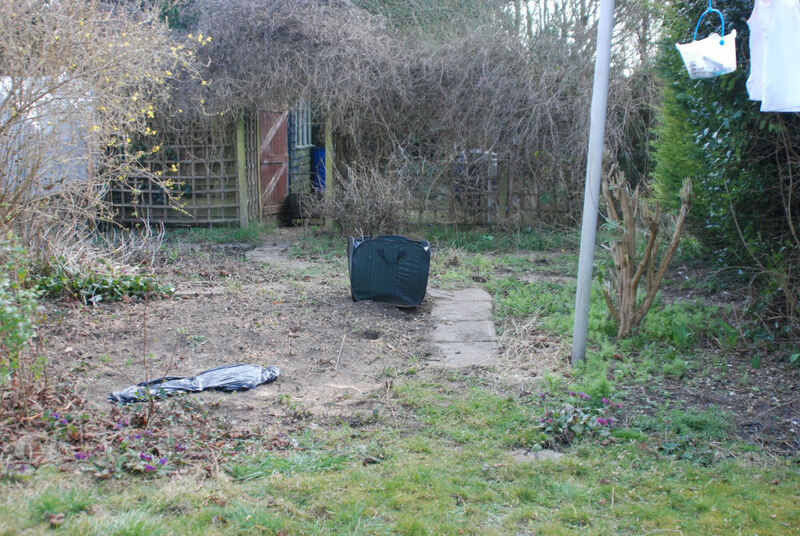 Since last Summer we have been trying, slowly, to get the garden sorted. It’s a long game, because we don’t have the time or energy mostly to keep on top of things, especially in Summer when just keeping the grass mown and bushes pruned is a full-time job. 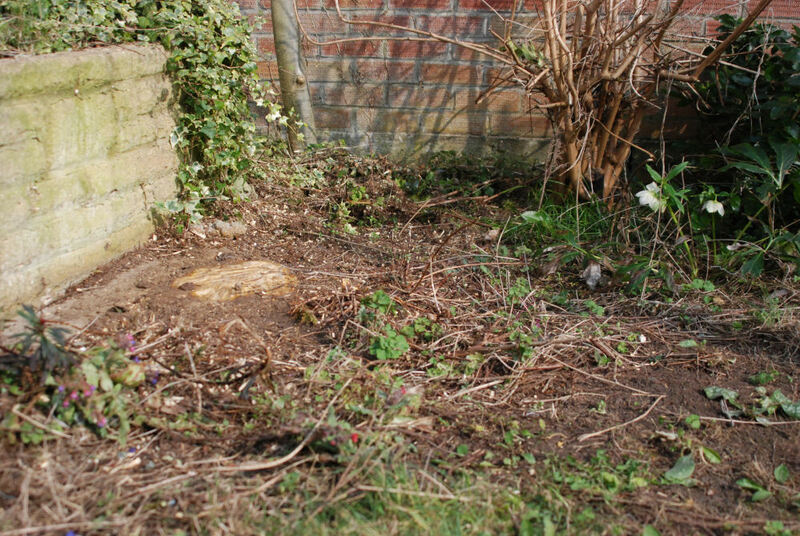 Last year we chopped down a few trees; not big trees, but big enough to leave sizeable stumps in the ground that were too big to dig out. This week I found a very nice chap to come over and chainsaw them all to ground level for basically petty cash, which I was very pleased with! He also poisoned the stump of the ribes to stop is growing back, but not before I have taken some optimistic cuttings to see if I can grow a small version in a pot, because it was a lovely bush and the bees adore it! As soon as I am able (hopefully in the next couple of weeks) I will start digging. Dig dig dig! Dig over the soil, which I know to be of good quality because I have been growing veg on it for a few seasons. I might still dig in some compost since I have a small amount of home-made stuff waiting to go. 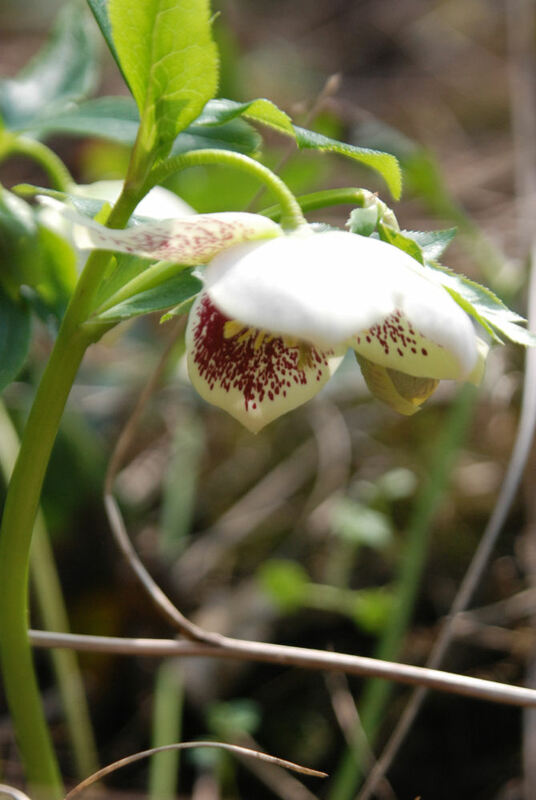 Order some grass seed and pre-sowing fertiliser. This should cost about £15. I looked into the cost of turf and swore. Somehow keep the girls off it for about one year!! Enjoy our lovely, big new lawn. THEN next year the lawn will be fully established and strong, and we can look into all the things we keep promising we’ll do – climbing frame/slide/swings, bikes, garden games, tents, picnics, general awesome fun! The messy shed area will be next. And planting some privacy hedging because our neighbours can see right in. Maybe a pond, further down the line. Lavender and other bee-friendly flowers. Anything that is low maintenance and wildlife-friendly! 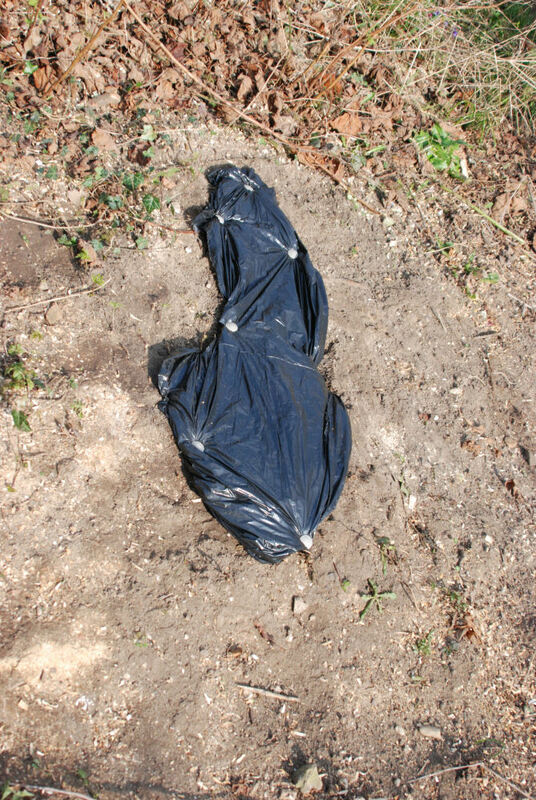 Unfortunately the unattractive bin bag has to stay on for at least a month, ideally longer, to help kill off the Ribes and stop the cat poisoning himself if he was stupid enough to get it on his paws. Then there are little things I love! Like this old piece of art that I made many years ago. There was a naked man to go with her but he broke. 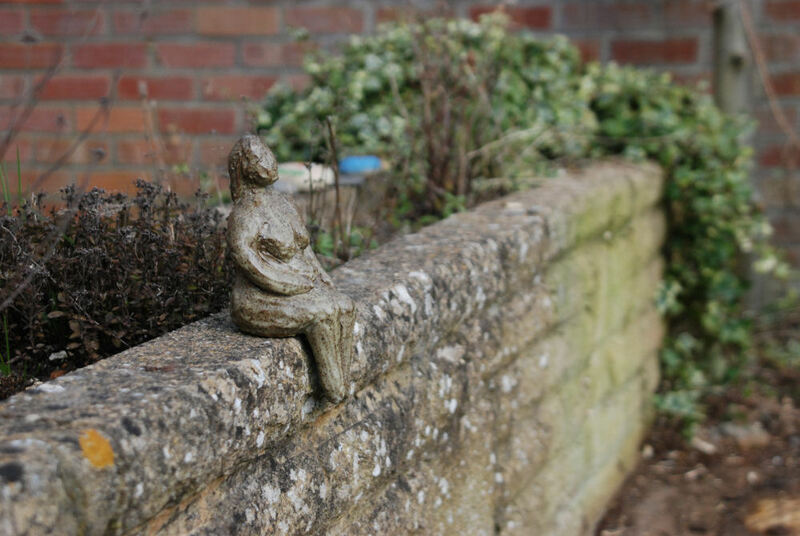 She has a lovely bottom, but I worry she gets cold sitting on the stone wall. 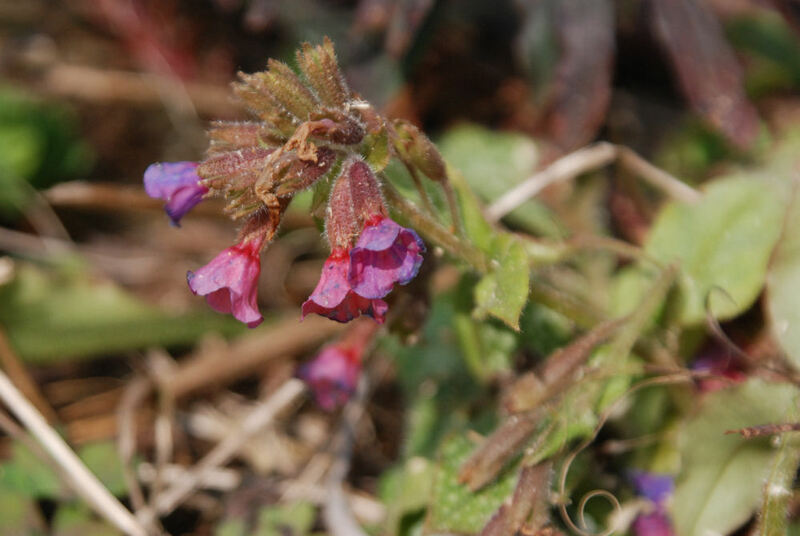 The semi-wild pulmonaria are early flowering, and have these lovely nectar-rich blue-purple flowers. They crop up all over the garden and I love them! 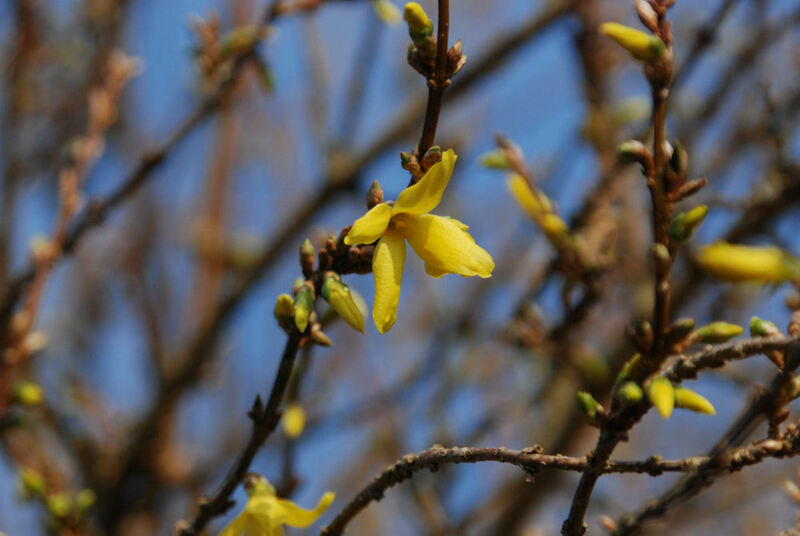 The forsythia is just coming into bloom. In a couple of weeks it will be covered in banana-yellow flowers! 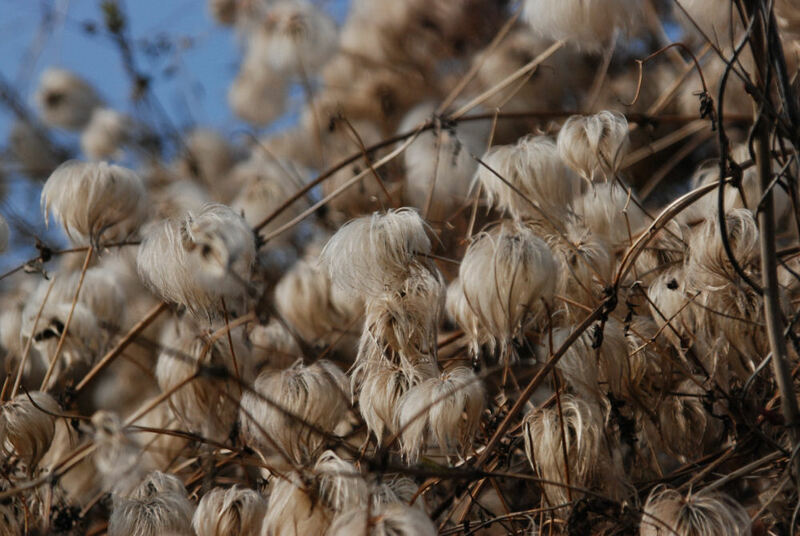 The cotton-soft seed heads from last year’s clematis flowers. This climbing plant has rather taken over but I’m still fond of it!